1.Nematocysts are present only in the epidermis. 2.Gametes are epidermal. These are released to the outside of the body. These are not released into gastrovascular cavity. 3.The mesoglea never contains amoeboid cells. 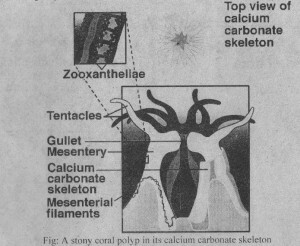 Most hydrozoans have colonial polyps. The individual polyps may be specialized for feeding, producing medusae by budding, or defending the colony. 1. 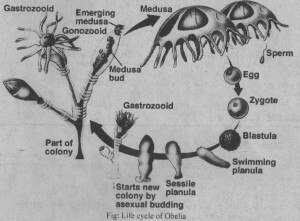 Gastrozooid: In Obelia the planula develops into gastrozooid. Gastrozooids are the most common type of polyp in the colony. Gastrozooid is a feeding polyp. The strozooid has tentacles. It feeds on microscopic organisms in the water. It secretes a skeleton called perisarc. Perisarc is composed of protein and chitin. 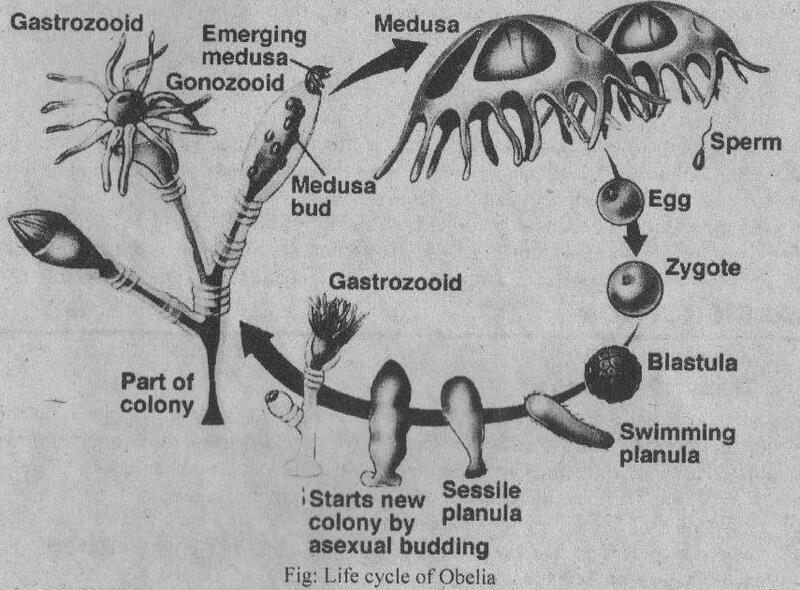 Growth of an Obelia colony takes place by the budding of the original gastrozooid. Root like processes grow into substrate. They anchor the colony and give rise to ranch colonies. The entire colony is a few ceritimeters high. It has a continuous astrovascular cavity, body wall, and perisarc. 2. Gonozooid: Obelia colony grows larger and gonozooids arc produced. A gonozooid is a reproductive polyp. It produces medusae by budding. 3. Medusae: Obelia has small medusae. It forms a stalk like structure of the gonozooid. When medusae mature, they break free of the stalk. It swims out through an opening at the end of the gonozooid. Medusae reproduce sexually and give rise to more colonies of polyps. 1. Adhesive pad: It attaches to seaweeds by adhesive pads. This pad is present on its tentacles. 2. Velum: The margin of the Gonionemus medusa projects inward. They form a shelf like lip called the velum. A velum is present on most hydrozoan medusae. But it is absent in all other cnidarian classes. Water is expelled from beneath the medusa. Velum concentrates this water to a smaller outlet. It creates a jet-propulsion system. 3. Manubrium and gastrovascular cavity: A tube like manubrium hangs from the lower surface of medusa. Mouth is present at the end of manubrium. Manubrium opens into gastrovascular cavity. four radial canals start from gastrovascular cavity. These canals extend to the margin of the medusa. An encircling ring canal is present at the margin of the medusa. It connects the radial canals. 4. Nervous System and sense organs: Gonoionemus has nerve net. It also has a concentration of nerve cells, called a nerve ring. Nerve ring encircles the margin of the medusa. The nerve ring coordinates swimming movements. Statocysts are embedded in the mesoglea around the margin of the medusa. A statocyst consists of a small sac. This sac surrounds a statolith. Statolith is composed of particles of calcium carbonate. Statolith moves in response to the pull of gravity. It initiates nerve impulse changes swimming behavior of animal. 5. Gonads: Gonads hang from the oral surface of medusa below the radial canals. Gonoionemus is dioecious. It sheds gametes directly into sea water. A planula larva develops. It attaches to the substrate and form a polyp (about 5 mm tall). The polyp reproduces by budding and develops more polyps and medusae. Hydra i a common freshwater hydrozoan. It hangs from the floating plants in clean streams and ponds. Hydra lacks a medusa stage. It reproduces both asexually and sexually . Asexual reproduction takes place by budding. These buds are formed from the side of the polyp. Sexual reproduction occurs in the polyp stage in hydra. But in all other hyrdoans, sexual reproduction takes place in medusa stage. Testes are conical structures. They are formed by the mitosis of interstitial cells. Sperms are formed by meiosis in the testes. 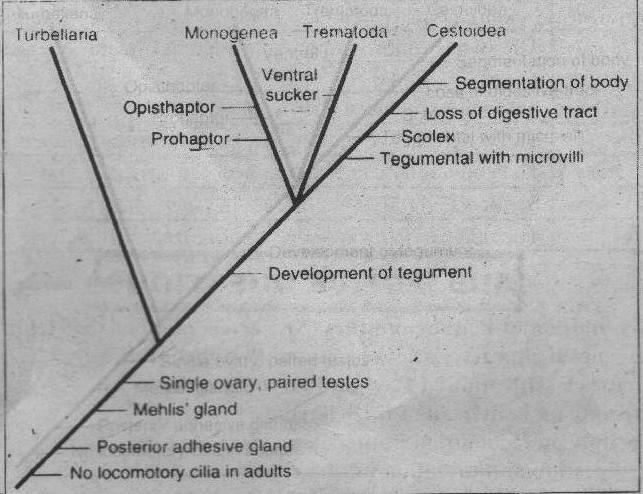 Mature sperm leaves the testes through temporary openings. Ovaries are also formed from interstitial cells. One large egg forms per ovary. Egg stores yolk. 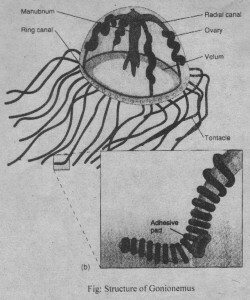 A chitinous shell is formed around the egg after fertilization. The embryo drops from the parent in winters. It is hatched in the spring and develops into an adult. It is commonly called the Portuguese man-of-war. It is a large and colonial siphonophore. It cannot swim. It floats on waves. Its dactylozooids have many nematocysts. These nematocysts are lethal to small vertebrates and dangerous to humans. Members of the class Scyphozoa are all marine. The dominant stage in their life history is the medusa. Therefore they are true jellyfish. The scyphozoans medusae lack a velum. The mesoglea contains amoeboid mesenchyma cells. Cnidocytes occur in the gastrodermis and epidermis. The gametes are gastrodermal in origin. Many scyphozoans are harmless to humans. Some others produce unpleasant smell. Some even cause dangerous stings. For example: Mastgias quinquecirrha. It is commonly called stinging nettle, It is a common Atlantic scyphozoan. It populations increase in late summer and become dangerous for swimmers. 1. Digestive system: The margin of its medusa has a fringe of short tentacles. Notches divide its margin. 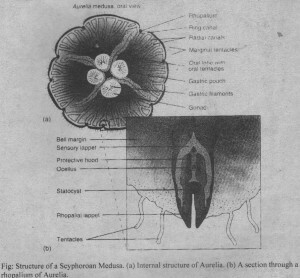 The mouth of Aurelia opens in stomach. Stomach has four gastric pouches. These pouches contain gastric filaments. Radial canals start from gastric pouches. These canals lead to the margin of the bell. Gastrodermal cells of all scyphozoans possess cilia. Cilia circulate seawater and partially digested food. 2. 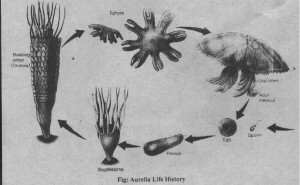 Nutrition: Aurelia is a plankton feeder. It sinks slowly into water. It traps microscopic animals in mucus on its epidermal surfaces. Cilia carry this food to the margin of the medusa. Four fleshy oral lobes hang from the manubrium. These lobes scrape food from the margin of the medusa. Cilia on the oral lobes carry food to the mouth. 3. Nervous system and sense organ: Sensory receptors are present on the epidermis. Aurelia also has eight specialized structures called rhopalia. These are present in the notches at the margin of the medusa. Each rhopalium consists of sensory structures. These structures are surrounded by rhopalial lappets. Two sensory pits arc associated with sensory lappets. These pits are olfactory in function. A statocyst and ocelli are associated with rhopalia. Ocelli are photoreceptor. Aurelia displays a distinct negative phototaxis. Aurelia comes to the surface at twilight and descends to greater depths during bright daylight. 4.Reproduction: Scyphozoans are dioecious. Aurelia has eight gonads. These are present in gastric pouches. Two gonads arc present per pouch. Gametes are released no the gastric pouches. Sperm swim through the mouth and come out of medusa. Eggs lodge are in the oral lobes. Fertilization takes place there. 5. Development: Zygote develops to form the planula stage. The planula develops in to polyp called scyphistoma. It lives for more than a year and undergoes budding. hese buds produce minute medusae called ephyrae. Repeated budding of scyphistoma continues. Thus ephyrae stacked on the polyp like saucers. Finally ephyrae arc released. They gradually attained the adult form. The tentacles hang from each of its corners. Polyps are very small. Polyp are absent in some species. Cubozoans are active swimmers and feeders in warm tropical waters. Some possess dangerous nematocysts. They include anemones and stony and soft corals. Anthozoa are all marine and are found at all depths. The mesoglea contains amoeboid mesenchyma cells. Externally, anthozoans show perfect radial Symmetry. Internally, they show bilateral symmetry due to mesenteries. 1. Habitat: Sea anemone is solitary, large and colorful animal. Some are attach to solid substrates. Some burrow in soft substrates. Some live in symbiotic relationships. The polyp attachcs to its substrate by a pedal disk. 2. DigeStive system: An oral disk contains the mouth and hollow oral tentacles. A siphonoglyph is present at one or both ends of the slit like mouth. Siphonoglyph is a ciliated tract. It moves water into the gastrovascular cavity and maintain the hydrostatic skeleton. 3. Mesenteries: Mesenteries are arranged in pairs. 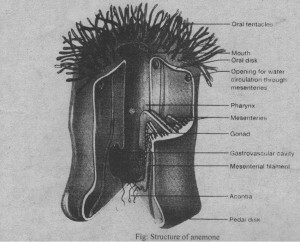 (a) The outer margins of some mesenteries are attached to the body wall.Their inner margin is attached to the pharynx. (b) Other mesenteries attach to the body wall. But they are free along their entire inner margin. Functions of mesenteries: Openings are present in mesenteries near the oral disk.Water circulates between compartments the mesenteries through these openings. The free lower edges of the mesenteries form a trilobed mesenterial filament. Messenterial filaments have cnidocytes, cilia, glands and absorption cells. Cilia help inwater circulation. The gland cells secrete digestive enzymes. Absorption cell absorb products of digestion. Thread like acontia are present at the ends of mesenterial filaments. Acontia bear cnidocytes. Acontia paralyze live prey in the gastrovascular caviyy. Sometimes, sea anemone is threatened. In this case, acontia can extruded through small openings in the body wall or through the mouth. 4. Muscles and hydroskeleton: Muscle fibers are largely gastrodermal. Longitudinal muscle bands are restricted to the mesenteries. Circular muscles are in the gasrodermis of the column. ‘Threatened anemones contract their longitudinal fibers. It allows water to escape from the gastrovascular cavity. Thus oral end of the column fold over the oral disk. Therefore, anemone is collapsed. Anemone gradually uptake water into the gastrovascular cavity through siphonoglyphs. It reestablishes the hydrostatic skeleton. 5. Locomotion: Anemones have limited locomotion. They glide on their pedal disks. They may crawl on their sides. They can also walk on their tentacles. Some disturbed anemones swim by thrashing (beating) their bodies or tentacles. Some anemones held gas bubble within folds of the pedal disk and float in water. 7. Reproduction: Anemones show both sexual and asexual reproduction. (a) Asexual reproduction: In this case, a piece of pedal disk breaks away from the polyp. It grow in to a new individual in a process called pedal laceration. Similarly, longitudinal or transverse fission may divide one individual into two. The missing parts are regenerated. (b) Sexual reproduction: Anemones may be monoecious or dioecious. In monoecious species, male gametes mature earlier than female gametes. This is called protandry. Thus self-fertilization does not occur. Gonads are present in longitudinal bands behind mesenterial filaments. Fertilization may be external or within the gastrovascular cavity. Cleavage takes place and planula is formed. Planula develops into a ciliated larva. It settles to the substrate and forms adult. Stony corals form coral reefs. They are similar to the anemones. But they lack siphonoglyphs. They have cuplike calcium carbonate exoskeleton. Name coral is derived form it. Exoskeleton is secreted by epithelial cells. These cells secrete exoskeleton around the base and the lower portion of the column. Threatened polyps retract body into their protective exoskeletons. Sexual reproduction is similar to anemones. Asexual budding produces other members of the colony. The colorful octacorallian corals are common in warm water. They have eight pinnate (feather like) tentacles, eight mesenteries, and one siphonoglyph. The bodies of members of a colony are connected. The mesenchyme cells secrete an internal skeleton of protein or calcium carbonate. Sea fans, sea pens, sea whips , red corals and organ-pipe corals are members of this group.